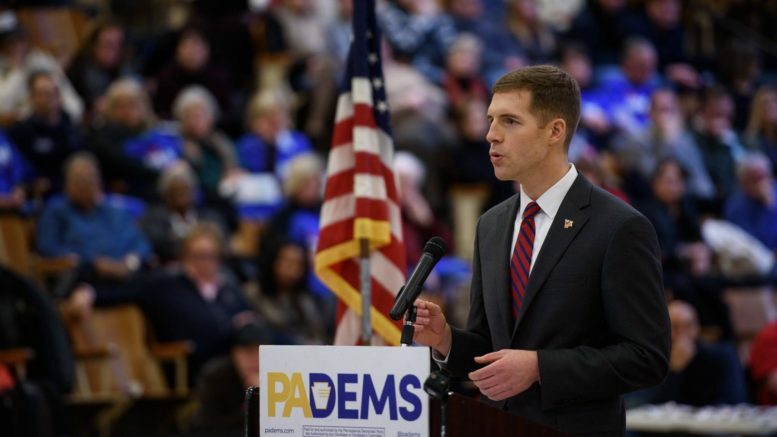 HOUSTON, PENNSYLVANIA- In a populist appeal to union members, Conor Lamb says that he intends to focus his campaign for the March 13th Pennsylvania 18th Congressional special election on labor issues. While touring the district, Lamb has told audiences that he intends to make protecting organized labor a central issue of his campaign in a district that contains 70,000 union members, nearly a quarter of all voters. “People in unions deserve the same level of respect that we give people in uniform because of how hard they have worked and all they have done,” the 33-year-old former Marine told workers at the Canonsburg VFW Hall on Saturday. Previously, Republican Congressman Tim Murphy had been able to win the election in the district by embracing issues such as prevailing wage, collective bargaining rights, and helping seek injunctive relief. As a result, Murphy was often able to secure the endorsements of several local unions in the district during his re-election bids while keeping other unions that would normally oppose him neutral. A key to Murphy’s 12-year political survival in a district that contains 70,000 more registered Democrats than Republicans was that he would regularly attend union events while accounting for the concerns of some union leaders. However, the Republican nominee, 60-year-old State Representative, and Tea Party veteran Rick Saccone, refused to even fill out the AFL-CIO questionnaire seeking their endorsement. Unlike past Republicans who have represented the district, Saccone has refused to attend union events. Saccone previously had supported legislation to repeal prevailing wage rates for construction workers on government projects as well as so-called “right-to-work” legislation. Lamb says that a central focus of his campaign will be drawing attention to his support for organized labor in a district that has never elected an anti-union Congressman. During his speech, Lamb spoke passionately of the monument to Philip Murray, the founding president of the Steelworkers Union, which sits in the churchyard of St. Anne’s Catholic Church in Castle Shannon, where his aunt’s funeral was held. (See Payday’s longform on the legacy of organized labor in Payday Senior Labor Reporter Mike Elk’s native Southwestern Pennsylvania). Lamb has sought to make his campaign a very uniquely Western Pennsylvania campaign, even going so far as to say that he won’t vote for Nancy Pelosi as Speaker of the House if elected and saying that he intends to reach out to Trump voters on labor issues. One issue that Lamb intends to focus heavily on is how Republicans in Congress have blocked a vote on the Coal Miner Pension Protection Act, which enjoys broad bipartisan support from coal-state legislators in both chambers of Congress. The bill would provide federal funding to save the United Mine Workers Pension Fund from insolvency. If the plan, which covers 135,000 beneficiaries, went insolvent, many coal miners would be forced to rely solely on Social Security. Despite calls from coal-state Republicans and Democrats alike, Speaker of the House Paul Ryan has refused to bring the bill to the floor for a vote. In September of 2016, Payday broke the story that billionaire anti-union Super PAC donor, Alliance Resources Partner CEO Joe Craft, was blocking the bill from coming to a vote in order to hurt his unionized competitors. In December of 2016, Murray Energy CEO Bob Murray, whose company would be hurt by the insolvency of the United Mine Workers pension fund, accused Craft of blocking the vote. In a district with tens of thousands retiree union miners, Lamb says he will work to secure passage of the Coal Miner Pension Protection Act. “We made a promise to these people a long time ago and if there is one thing that we have always been about here in Western Pennsylvania, it’s keeping our promises,” said Lamb. Lamb’s focus on organized labor as a central campaign issue has labor leaders in the district excited about the possibility of his success in the March 13th Special Election. “We’re united and excited as never before to get out the vote,” said Pennsylvania AFL-CIO Secretary-Treasurer Frank Snyder. 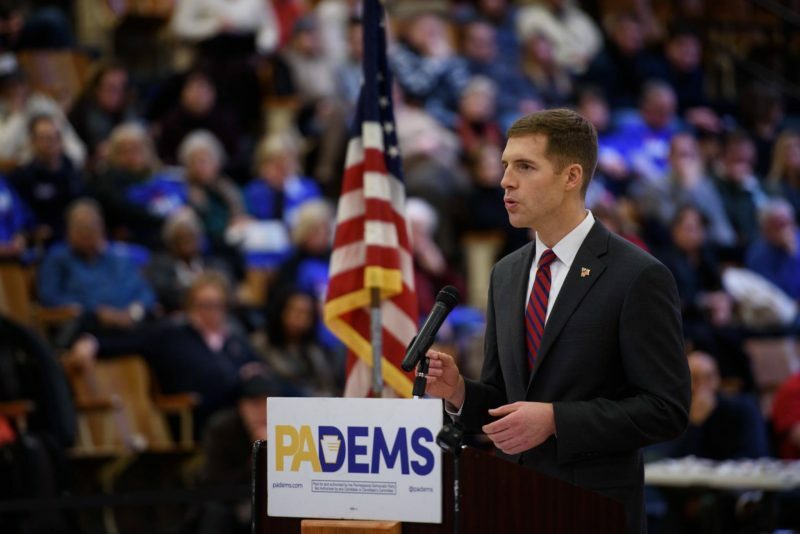 Be the first to comment on "Conor Lamb Plans to Make Unions A Central Focus of His Campaign in #PA18 Special Election"